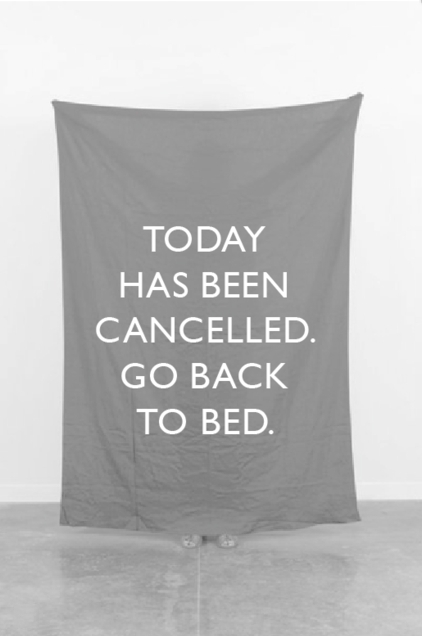 You wish today was cancelled, right? It’s Monday and all you can think about is the past weekend and looking forward to the next. After a challenging long run on Saturday and biting the pavement once again (you’d think I’d learn) I was ready for a relaxing day and getting to bed early tonight. After wrapping up the to-do list for the day I hit the sack at a decent time. The only problem is I couldn’t seem to stay asleep. Fresh snow and a frozen layer of ice underneath from the previous snow storm made for yet another exhausting long run on Saturday. It was one of those long runs where you wanted to give up after four miles…getting to 12 works every mind game strategy in the bag. Add a nice little one-on-one time with the pavement at mile eight and all tricks go out the window. I needed to change my game plan. Sometimes the hardest runs are not the most challenging physically, but rather mentally. I realized I was thinking about how cold I was and how much I really did not like snow at that particular moment in time, and that I should instead be thinking about someplace I wanted to be and warmer temps. I had a long run not too many moons ago in the warmer weather of fall and the entire run had the song “Knee Deep” stuck in my head. It drove me absolutely batty at the time but now I began to think about sandy beaches, getting lost in the sunshine, and how good it would feel to be running in shorts and a tank instead of three layers of clothes feeling like the Michelin Man. I got through my run one mile at a time and headed home where I crawled up the stairs (somewhat literally) and into a steaming hot shower. Ahh, the rewards of hard work which included a hot shower, staying in my pajamas the rest of the day, and enjoying some quiet time. I know you don’t have to run 12 miles to enjoy those things, but they seem so much more rewarding knowing how hard you’ve worked for them. Monday is on the horizon and there’s still ice and snow on the ground. I have eight miles to greet me on the road at 4AM, but unfortunately can’t put my pajamas on and head back to bed afterward. I’ll get through this winter and I’ll be stronger because of it. At least that’s what I keep telling myself. It doesn’t always get easier ~ sometimes you just get better.